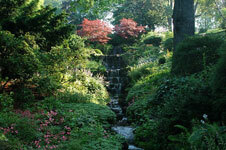 Along with being Toronto's largest public park, High Park is also one of the city's most important natural areas. Visitors will encounter woodland, wetlands, a beautiful lakefront, prairie habitats and a preserved slice of the black-oak savannah ecosystem that once covered most of southern Ontario. It all makes for an idyllic setting in which to enjoy the park's playgrounds, zoo, dog park, hiking trails, greenhouses, picnic areas, eateries and sporting facilities. Parking is convenient and public-transport access is easy. All said, High Park makes for a complete day out.